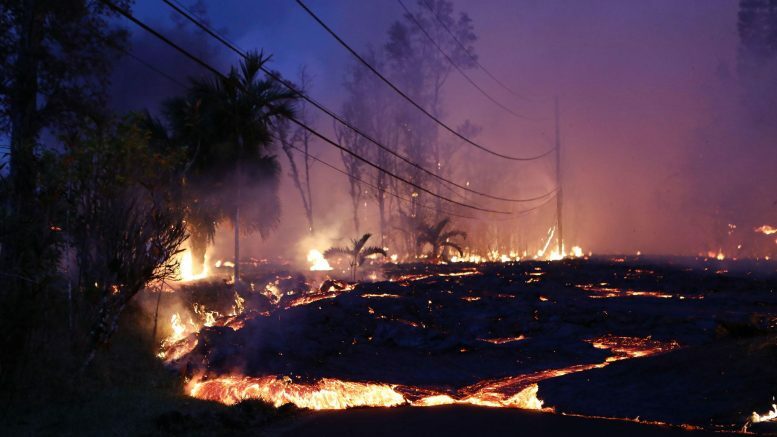 After the eruption of Kilauea on Maui, Hawaii’s biggest island, on May 3rd, residents have found the outcome intense. The US Geological Survey issued a red alert, meaning that a large eruption is imminent. The largest crater is launching ash into the air. But ash isn’t the biggest problem residents face. Sulfur Dioxide, a highly poisonous gas, is leaking out of the twenty one fissures in the ground. Authorities warn that if you feel even slightly affected by the gas, you should leave the area and seek medical help. Symptoms may include runny nose, coughing, and burning eyes. Ensure you get help quickly, because it can result in choking. Then, there is the lava. Although it is very slow, it is still extremely dangerous. Lava is currently spewing out of two fissures and can be launched over 100 feet in the air. Another concern is the water eruptions. When the ocean water boils due to the extreme heat of the magma it builds pressure and ends up shooting into the air. If the lava reaches the ocean it can have a catastrophic effect. The water starts to boil and releases plumes of poisonous gas. This is an ongoing problem for Hawaii and the state has declared a state of emergency. So far there has been one injury and no deaths. The victim of injury has recovered. The infrastructure (i.e. roads, homes, schools, etc.) destroyed might take decades to repair/replace.